by Arnold, Clinton E., Baugh, Steven M., Davids, Peter H.
Arnold, Clinton E., Baugh, Steven M., Davids, Peter H.
Discover: ?How the springs at Hierapolis help us understand why Jesus described the church at Laodicea as ?lukewarm? 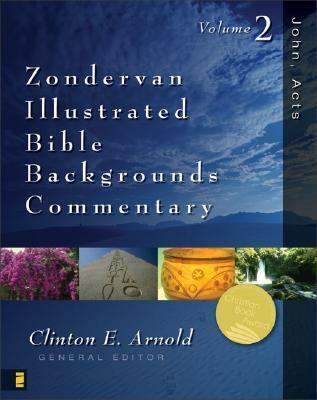 ?The background and circumstances of certificates of divorce in Judaism ?How Jewish dietary laws provided a powerful metaphor for God's acceptance of the Gentiles Brimming with lavish, full-color photos and graphics, the Zondervan Illustrated Bible Backgrounds Commentary walks you verse by verse through all the books of the New Testament. It's like slipping on a set of glasses that lets you read the Bible through the eyes of a first-century reader! Discoveries await you that will snap the world of the New Testament into gripping immediacy. Things that seem mystifying, puzzling, or obscure will take on tremendous meaning when you view them in their ancient context. You'll deepen your understanding of the teachings of Jesus. You'll discover the close, sometimes startling interplay between God's kingdom and the practical affairs of the church. Best of all, you'll gain a deepened awareness of the Bible's relevance for your life. Written in a clear, engaging style, this beautiful set provides a new and accessible approach that more technical expository and exegetical commentaries don't offer. It features: ?Commentary based on relevant papyri, inscriptions, archaeological discoveries, and studies of Judaism, Roman culture, Hellenism, and other features of the world of the New Testament ?Hundreds of full-color photographs, color illustrations, and line drawings ?Copious maps, charts, and timelines?Sidebar articles and insights ?Reflections? on the Bible's relevance for 21st-century living Written by leading evangelicalcontributors: Clinton E. Arnold (Ph.D., University of Aberdeen), General Editor S. M. Baugh (Ph.D., University of California, Irvine) Peter H. Davids (Ph.D., University of Manchester) David E. Garland (Ph.D., Southern Baptist Theological Seminary) David W. J. Gill (D.Phil., University of Oxford) George H. Guthrie (Ph.D., Southwestern Baptist Theological Seminary) Moyer V. Hubbard (D.Phil., University of Oxford) Andreas J. K?stenberger (Ph.D., Trinity Evangelical Divinity School) Ralph P. Martin (Ph.D., University of London, King's College) Douglas J. Moo (Ph.D., University of St. Andrews) Mark L. Strauss (Ph.D., University of Aberdeen) Frank Thielman (Ph.D., Duke University) Jeffrey A. D. Weima (Ph.D., University of Toronto) Michael J. Wilkins (Ph.D., Fuller Theological Seminary) Mark W. Wilson (D.Litt. et Phil., University of South Africa) Julie L. Wu (Ph.D., Fuller Theological Seminary) Robert W. Yarbrough (Ph.D., University of Aberdeen)Arnold, Clinton E. is the author of 'Zondervan Illustrated Bible Backgrounds Commentary John, Acts', published 2002 under ISBN 9780310218074 and ISBN 0310218071. Loading marketplace prices 9 copies from $93.58 How does the rental process work?